Combine gelatin and 1/2 cup cold water in the bowl of an electric mixer fitted with the whisk attachment. Let stand 30 minutes. Combine granulated sugar, corn syrup, salt, and 1/2 cup water in a small, heavy saucepan; set over low heat, and stir until sugar has dissolved. Wash down sides of pan with a wet pastry brush to dissolve sugar crystals. Clip on a candy thermometer; raise heat to high. Without stirring, cook syrup until it reaches the firm-ball stage (244 degrees). Immediately remove pan from heat. Cover an 8- by 12-inch glass baking pan with aluminum foil, and apply non-stick vegetable spray. Pour marshmallow mixture into pan. Smooth with spatula sprayed with vegetable spray. Dust with confectioners' sugar; let stand overnight, uncovered, to dry out. Turn out onto a board, and using a dry hot knife, cut marshmallows into 1 1/2-inch squares, and dust with more sugar. This looks great! 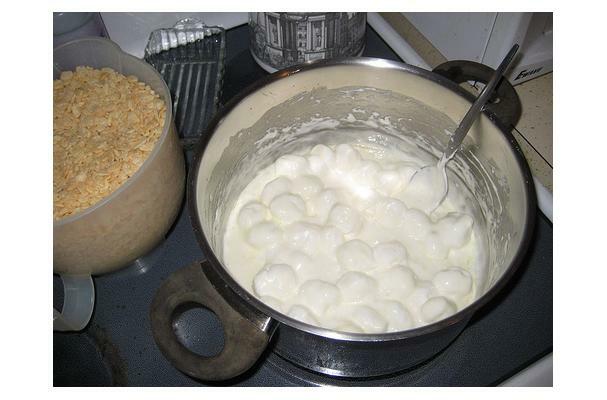 I will definately try making my own marshmellows next time I make rice cruspy treats. Thanks! this is great food if u want make this our home then u make this process.